Is Activated Charcoal Good For Your Teeth? If you’ve paid any attention to the wellness industry and social media lately, might have seen ads for activated charcoal. We’re not talking about the charcoal that you throw into your barbecue to grill. Activated charcoal is a black powder made from coconut shells and has powerful detoxifying effects. Since 1834, people have discovered new uses activated charcoal, like preventing drug overdoses. Activated charcoal binds to toxins, so it can be used as an emergency poison treatment. Today, the wellness industry is promoting activated charcoal as a natural way to whiten teeth. But does this method of teeth whitening work? Your Westchester cosmetic dentist has researched this and found some pretty interesting results. Activated charcoal is a finely milled black powder. The charcoal is processed with high heat, which “activates” it. This will change its internal structure, making it more porous than regular charcoal. More porous means more absorption power. Since activated charcoal has a porous texture, this adds to its efficiency and it can trap and remove unwanted substances. Activated charcoal can absorb toxins and free radicals both in and outside of your body. What Does This Mean For My Teeth? Teeth whitening has become a huge industry over the last decade. People are always finding new ways to whiten teeth. From dental office treatments to DIY home remedies, it is clear that a white smile is a desired trait. Teeth whitening has become a huge industry over the last decade. People are always finding new ways to whiten teeth. From dental office treatments to DIY home remedies, it is clear that a white smile is a desired trait. 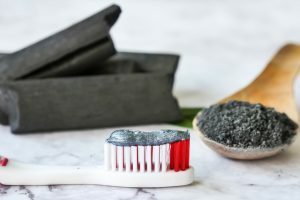 While the FDA has approved activated charcoal for many health benefits, the American Dental Association has not currently approved any activated charcoal products for dentistry. Can I Use Activated Charcoal? You can use activated charcoal to whiten your teeth, but use it in moderation. Teeth do not regrow or replenish. Once enamel is gone, it’s gone. So using it too much could wear down the enamel and harm your teeth. The whitening ability exists because it is porous, but it can also be too abrasive. So, your Westchester cosmetic dentist recommends you find a charcoal toothpaste that isn’t abrasive, and use it once a week. You should still use a regular toothpaste every day. As with any at home remedy, use with caution and in moderation. If you have any questions about this or any other dental concerns please give our office a call today. As one of the best dentists in Westchester we can answer any questions you may have and provide a safe guide to your teeth whitening needs.